It's Apple Week and we are celebrating all things apple! This flavorful dinner, combines the wonderful autumn seasonal tastes of sausage, apples, bacon and sweet potatoes and tops it with a light bbq- apple butter sauce glaze that will just put this dinner over the top! Don't forget to enter the giveaway at the bottom of this post! For a full list of prizes see the welcome post! The perfect blend of savory and sweet in one dish, this dinner has something for everyone to love. 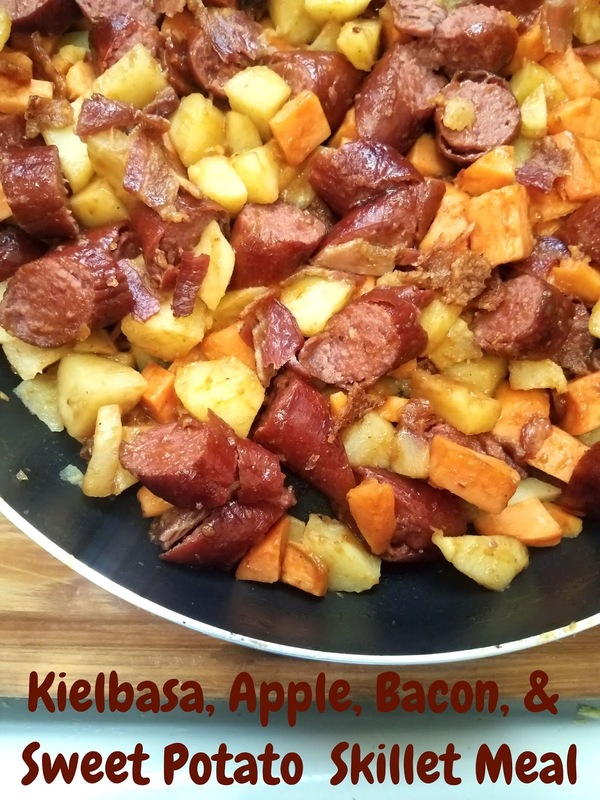 The Kielbasa and Bacon for the meat-lovers, and the lightly sweet apples and sweet potatoes for the sweet lovers. The light bbq-apple butter glaze over the dish just adds to the smoky, tangy, dish and kisses it with a depth of flavor for just the perfect combination. Sponsor Shout Out: NordicWare provided me with this baking pan for Apple Week this week. 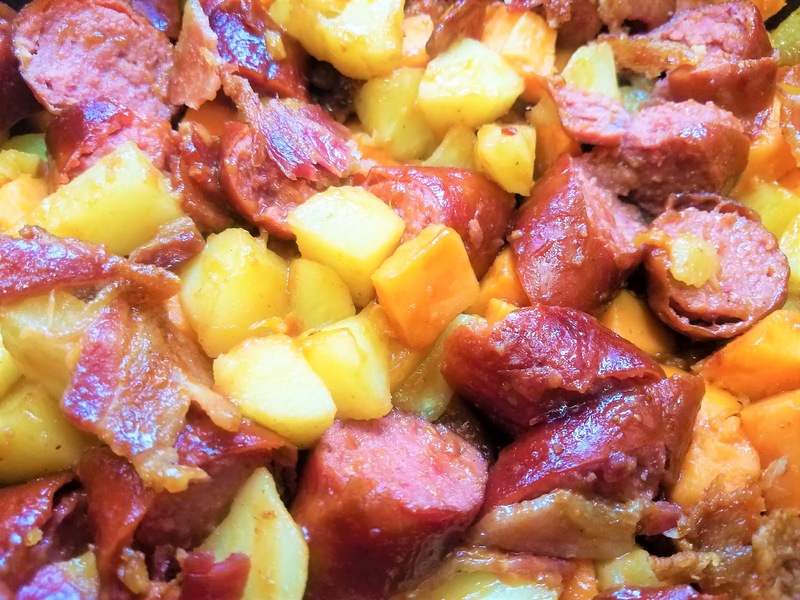 I used the pan on this recipe to cook the bacon and kielbasa. I love that it drains away the grease and crisps the bacon to perfection, but also is versatile for other foods also! Such a versatile pan like so many of the other NordicWare products! 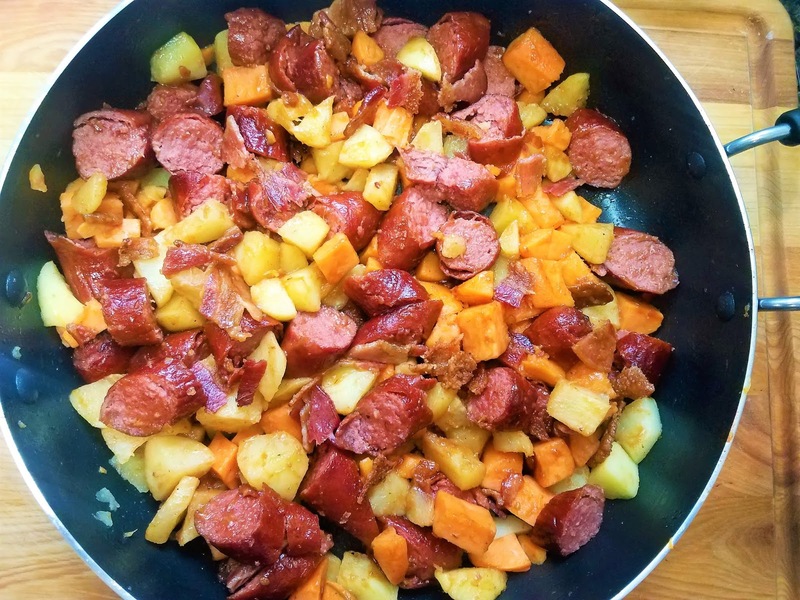 I have used this meal for a family breakfast as well as a dinner, and you can't go wrong either way! For breakfast I serve this with a big plate of scrambled eggs, and warm biscuits, and I promise you all the platters are empty, and all the bellies are full! A savory and sweet dinner or breakfast meal, made easy as a sheet pan dinner in the oven, or a quick stir fry in the skillet. It's hearty and filling. 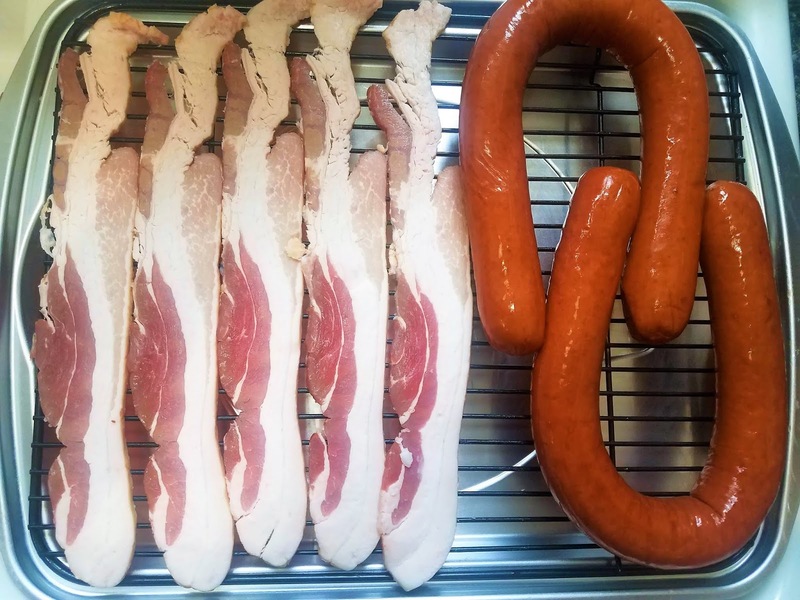 Layer bacon and Kielbasa on a baking sheet with sides.Bake till Bacon is crisp, turning over after 7-8 minutes. While meat is cooking in oven, in large skillet over medium-low heat add olive oil or butter. Add apples and sweet potatoes. Cook stirring occasionally till potatoes are tender, approx. 8 -10 minutes. Remove Meat from oven when Bacon is crisp, and Kielbasa is browned on the outside. Slice Kielbasa into 1 inch slices. crumble bacon into bite size pieces. Add meat to Skillet with apples adn potatoes. Stir to combine. In small dish combine bbq sauce, apple butter and mustard. Stir to combine. Pour Sauce into skillet and lightly toss over potato, apple, kielbasa mixture. Serve warm. Jan, that looks like something we're going to love!